Congregate Dining provides nutritious meals in a group setting, allowing for opportunities to socialize with others. Meals are provided Monday through Friday at eight dining sites (see below). Home-delivered Meals are provided to eligible individuals who are unable to attend one of the local congregate dining sites. To determine eligibility, please contact the ADRC at 608-785-5700. To learn more, reference brochures located below or call the ADRC at 608-785-5700 or 800-500-3910. Effective January 1, 2019, for eligible individuals, the suggested donation for congregate dining increased to $3.75 and for home-delivered meals to $4.00. Ineligible individuals, guests under the age of 60, will pay $9.25 per meal. Eat at least 3 oz of whole grain cereals, breads, crackers, rice or pasta every day. Eat more dark-green veggies like: broccoli, spinach and other dark leafy greens. Eat more orange vegetable like carrots and sweet potatoes. Eat more dry beans and peas like: pinto beans, kidney beans, and lentils. Choose fresh, frozen, canned, or dried fruits. Go low-fat or fat free when you choose milk, yogurt, and other milk products. If you don't or can't consume milk, choose lactose-free products or other calcium sources such as fortified foods and beverages. 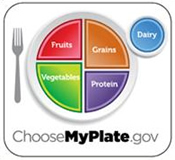 Vary your protein routine - choose more fish, beans, peas, nuts, and seeds. Eat 6 oz. every day Eat 2.5 cups every day Eat 2 cups every day Get 3 cups every day Eat 5.5 oz. every day. Carroll Heights 3505 Park Lane Dr.
Forest Park 1230 Badger St.
Harry J. Olson Sr. Center 1607 North St.
Stokke Tower 421 S. Sixth St.
West Salem Whispering Pines 780 East Ave.